The experience presented is part of the teaching of two subjects of the Mechanics discipline: Continuum Mechanics and Strength of Materials, in the field of Mechanical and Industrial Engineering. In the bachelor’s degree at the ETSEIB-UPC, the first semester of the third academic year is devoted to Continuum Mechanics and the second one to Strength of Materials. Both subjects integrate theory and practice: applications, lab and coursework. The article focuses on the coursework or also named course project, which consists of designing/optimizing, analysing, manufacturing and testing a mechanical/structural element subject to stresses and strains. This paper aims at showing the benefits of combining practice, theory, simulation and experimentation, as well as some of the limitations and difficulties encountered in its implementation, such as the evaluation of the degree of involvement of each team member and the lack of correlation between the mark of the coursework and examinations’ scores. An important conclusion is that students enjoy the project, get deeply involved and work hard, making the subject more attractive. Pastor, M.M. [et al.]. Learning in engineering through design, construction, analysis and experimentation. 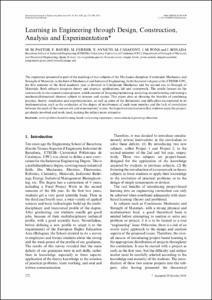 "International journal of engineering education", 2019, vol. 35, núm. 1(B), p. 372-384.